Tourist trap or living history? A review of Union Oyster House at 190. 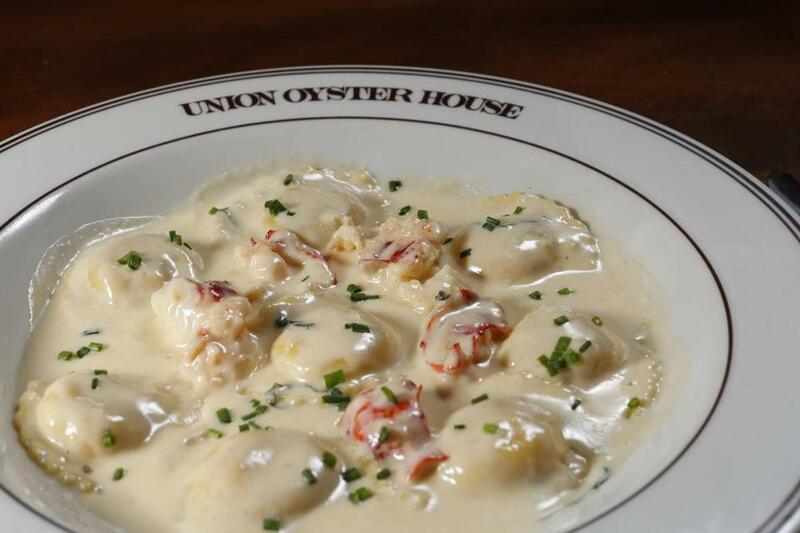 Lobster ravioli at Union Oyster House. Few restaurant red flags loom quite so large as the attached gift shop. A pint glass or T-shirt for sale by the bar is one thing: Who wouldn’t want to savor the memory of a weekend in Tampa every time they crack a beer or clean the bathroom? It’s once you’re into stuffed animals and souvenir hats that you’ve likely lost your way. So it goes at ye olde Union Oyster House — everything here is ye olde — where there are about as many plush lobsters in ye olde adjacent gift shop as live ones in the tank. Nearly everyone who has spent more than a few days in Boston has made at least one visit to Union Oyster House. Over its 190 years, it grew into the kind of place that celebrities and politicians stopped for a photo op whenever they swung through town. The result is a history richer than any chowder: A booth upstairs was JFK’s special spot; a wall in the bar is covered with plaques honoring hundreds of famous guests. In a city that prides itself on its history, it’s one of a handful of truly historic eateries remaining. That makes Union a real institution. A proud employee responds to the Globe’s pointed review of the restaurant last week. Read: Dining Out: Where should you eat this week? olde Authentic New England Experience. And Daniel Webster, according to the back of the menu, routinely slurped down six platefuls of oysters here, downing a “tall tumbler of brandy and water” with each plate. So let’s start with the oysters. At $16.50 for a half-dozen, they’re at the high end of the going rate for oysters in town, and a platter can be put together a la carte for considerably less at some pretty fancy joints. But would you get the Authentic New England Experience of six oysters crammed onto a warm plate so small that the back of each shell leaches gray New England mud onto the flesh of the oyster behind it? Would you, at some newfangled place with shaved horseradish ice and tiny forks and mignonette, learn to know the authentic taste of the silty beds where these creatures began their short lives? While the Katama Bay and Cotuit varieties on the menu recently were quite likely alive when shucked, they clearly lost the will to live long before that. Their shells crumble in on themselves. Some have scant meat plastered dryly to the insides of their shells; it has to be peeled off with a fork. Such oysters would be disappointing at a $1-a-pop happy hour; at these prices, you’re paying an awful lot for history. And that nobody can be bothered to rinse down the outside of the oysters’ shells suggests a kitchen that has had 190 years to find its laurels and rest on them. OK, what about the clam chowder? I’ve heard good things — I know at least one guy who wanders over from City Hall at lunch now and again. It is slightly starchy but reasonably satisfying, a clam-studded crowd-pleaser. But if you find yourself adding salt — or sucking down more than a cup — put down the shaker, pay your bill, and go directly to get your blood pressure checked. President Obama’s take-out order when he stopped in last fall — 10 chowders to go — could be viewed as an assassination attempt if placed by a political rival. Steamers — “sometimes sandy,” the menu cautions —are tasty and fresh, presented as you might find them at a seaside summer clam shack. But mussels vary wildly in size, making consistent cooking impossible. Let’s pause between courses to admire the space, which resembles ye olde rabbit warren as decorated by a Colonial-era hoarder. The place is so densely packed with historical miscellany, it begs for extensive exploration of various nooks. The second-floor dining room is cozy, all dark wood and warm, dim lighting. The booths hark back to a time when ye olde American physique wasn’t quite so regal: One rotund tourist becomes so wedged in he may still be there now. 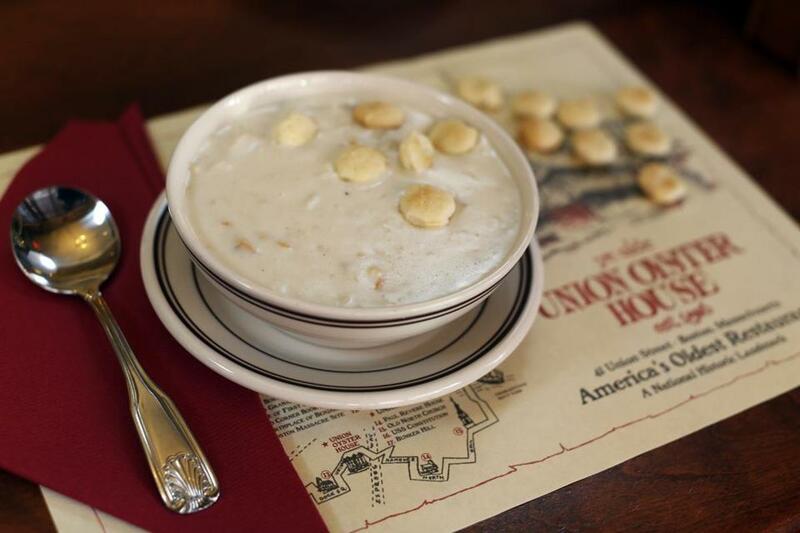 When you claim to be America’s Oldest Restaurant, all of this is part of the charm. People will rightly pay a premium to eat where their forefathers ate, which also makes Union Oyster House what you’d call “review proof.” At a recent meal, a tourist asks his server what those steaming glass and steel structures out the window are. A somber, sweeping monument to massive human tragedy erected right outside might have doomed another restaurant. But you don’t survive 190 years in this business by accident: The guys at ye olde raw bar kept right on shucking, and people kept coming in droves. And if the food were just a notch or two better, the experience might be worth the price. Instead, the kitchen churns out dish after dish that makes it seem like an afterthought. Take “Broiled Fresh Boston Scrod — a New England Tradition,” precisely that and nothing more. A square piece of white fish and a spoonful of breadcrumbs darkened slightly by flame and resting alone on a plate. The baked potato on the side will likewise never be mistaken: It’s a potato, and it has been successfully baked. Ye Olde Seafood Platter is a reasonably good representation of low-end fried seafood — the kind of crispy breaded shrimp and scallops and whatnot you’d get near the Quincy shore in the summer. Whole-belly clams taste fresh, and scallops stay juicy under the breading. 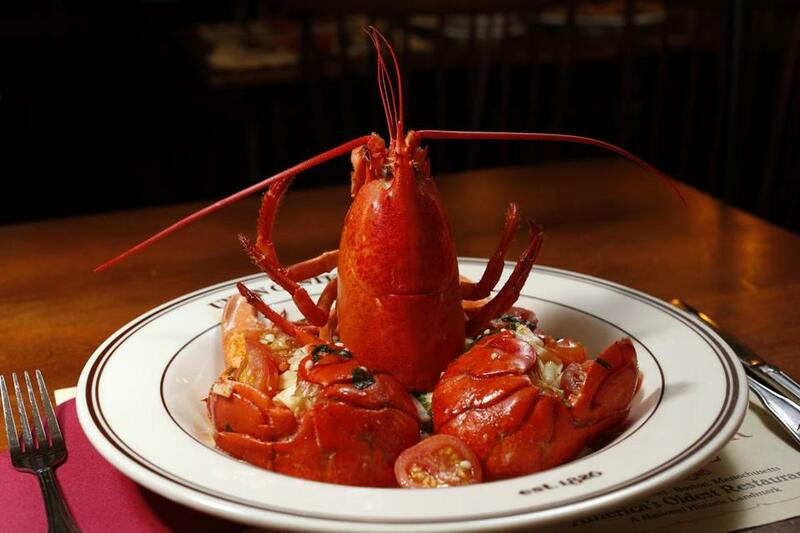 Lobster dishes, surely a favorite of tourists on the way to Paul Revere’s place, range from adequate to bizarre. Lobster ravioli is vaguely satisfying, unless you’ve had the same dish almost anywhere else in Boston. The cream sauce is rich, but while most lobster dishes here are amply lobstered, there isn’t enough meat tucked in and around the pasta. Lobster scampi arrives with the crustacean’s head and torso, sans claws, staring up from a bed of linguine, its tail and flesh strewn about with halved cherry tomatoes. Removing the body leaves behind a green puddle of lobster goo in the center of the perfectly good pasta. And Union Special Lobster is special indeed: A wan and ludicrously expensive lobster is disemboweled and then crucified on a skewer, its innards replaced with a mushy brown stuffing. Any sweetness in the flesh has been replaced by what surely is the essence of the tank where the poor thing spent its last days. This monstrosity somehow costs $46. Not really, but here goes. The Indian pudding, she explains, is like pumpkin pie, but pudding. Once the whipped cream is devoured, everyone at the table loses interest. Ah, and now here’s that beer you ordered with ye olde lobster 45 minutes ago. Next time, better make it six tall tumblers of brandy. Hold the water. 41 Union St., Boston, 617-227-2750, www.unionoysterhouse.com. All major credit cards accepted. Wheelchair access downstairs only. Prices Appetizers $12.95-$18.95. Entrees $22.95-$36.95. Lobster and some other seafood dishes are market price. Hours Sun–Thur 11 a.m.-9:30 p.m., Fri–Sat 11 a.m.-10 p.m.; bar open until midnight daily. Noise level Wildly variant, approaching cacophonous in the upstairs dining room.